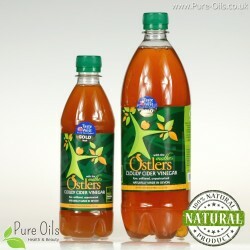 Ostlers is a family run company producing high quality apple cider derived from traditional orchards located in Devon. In 2013 they were converted into organic orchards. The whole process of production takes place naturally. Apple cider vinegar is produced according to the old recipes as a result of fermentation and it is an unpasteurized and unfiltered product. It has a turbid consistency because it contains a Mother. Rich in valuable bioactive ingredients that help our health and improve digestion. In recent years Ostlers Cider Mill has won many awards such as "Best of Sauces and Accompliments 2012" in "Taste of the West" and "Gold" in 2012, 2013, 2014 and 2015.